Being able to fix up this house over the past year and a half has been a dream come true! But it’s a bit of a letdown when people enter through the front door and see this lackluster first impression of our home. Needless to say, I’m so excited to finally be moving forward with finishing up this space! It will be the last major project we work on for a while, because Phil and I need a break… like yesterday. Over the past couple of months I’ve been working on making final decisions with flooring, stair finishes, and front door options. There is so much to consider, so I’ve been making a concerted effort not to rush the design process! Check out the before pictures below, and read on to see the finalists for each finish option. 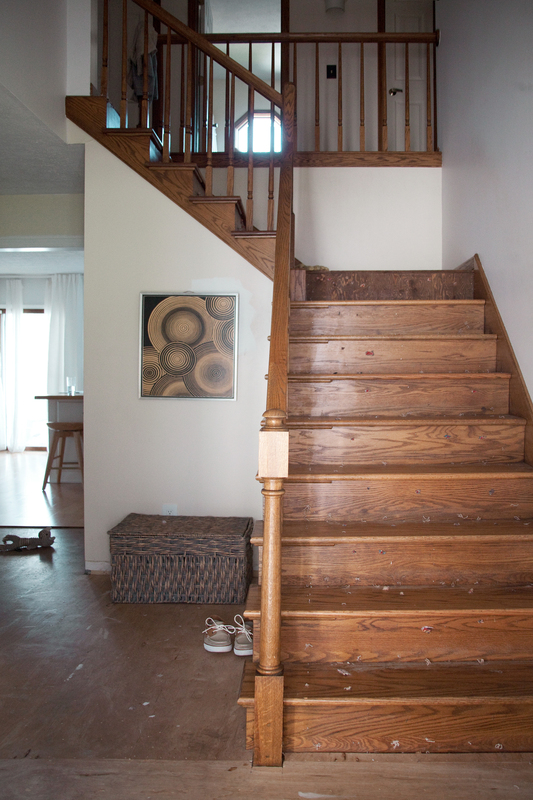 When we moved in, there was thin wood flooring in the entryway— all various widths with fake nail holes. The flooring was nowhere to be found in the rest of the home, so while I actually liked the look of it, we decided to rip it out. I had planned to install the same maple flooring here that I have done throughout most of the first floor, but the more I thought about it, the more I worried about excess moisture at our front door because of rainy and snowy Ohio weather. In addition to the moisture issue, I began to get excited about the prospect of doing a fun patterned floor in here. It would be a great opportunity to do something interesting, especially since this floor would only be seen from behind the island of the kitchen as well as the study. I wouldn’t have to worry about a pattern in here visually affecting any other major areas of the house. One thing I knew for sure about the stairway was that the shag carpet had to go! Phil ripped it out last weekend, and we’ll be working on those staples next. 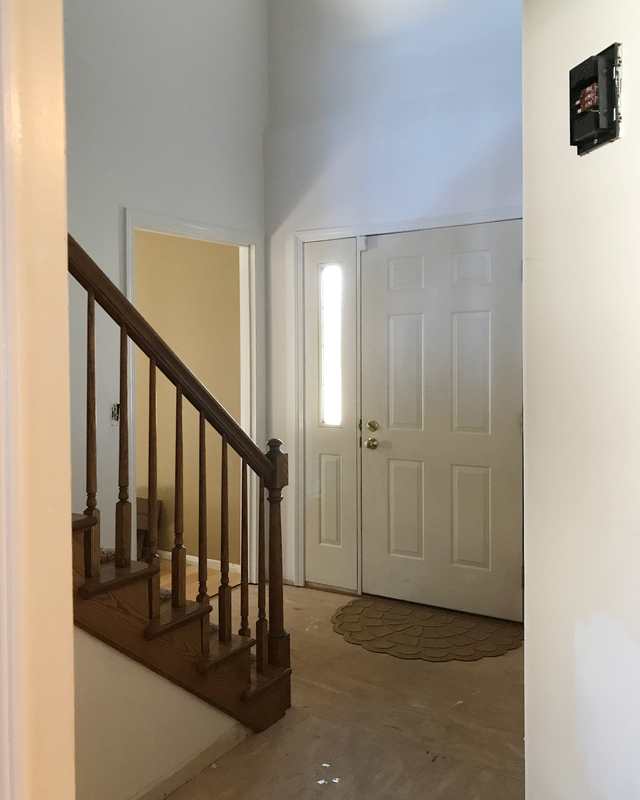 At first I wasn’t sure if I wanted to have the stairs carpeted at all, but we talked about it as a family and decided it would be cozier and safer to go for carpet. So then I was left with two choices: What kind of finish to do on the stairs, and what kind of carpet. 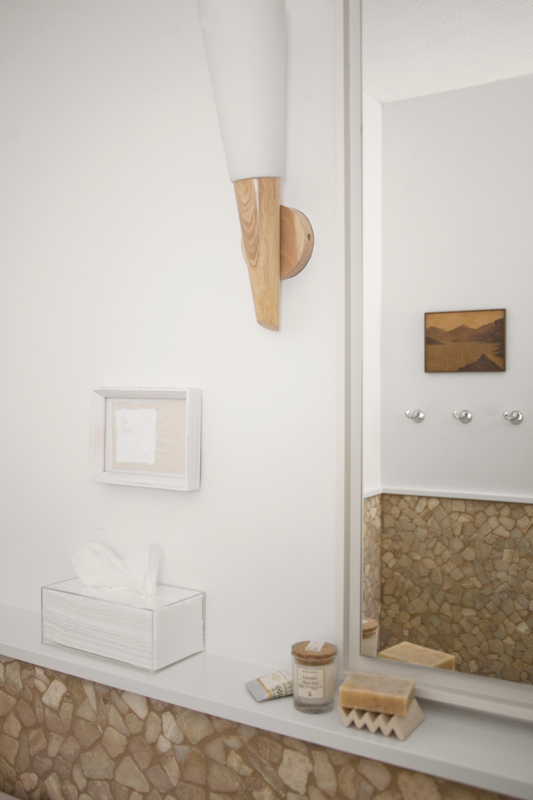 I love the idea of a natural wood tread, and white risers. The combination of wood and white adds interest and warmth. 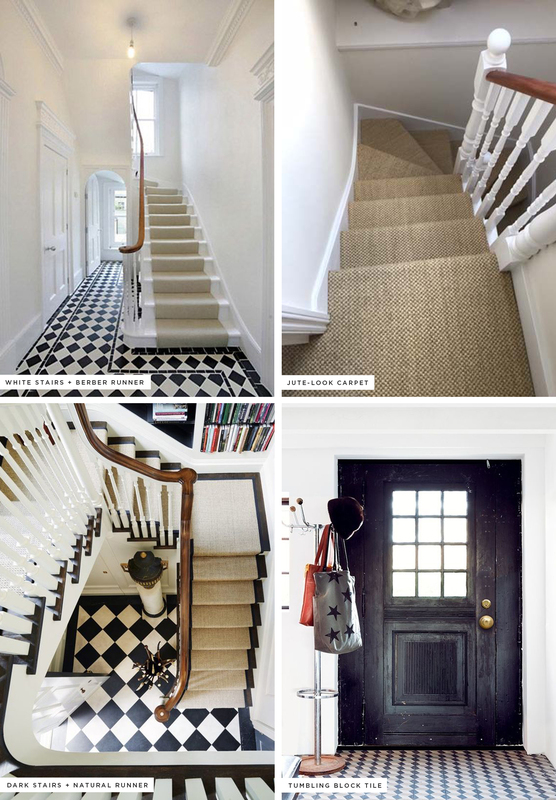 But the more I thought about doing a fun patterned tile on the floor, the more I thought a simple and low-contrast situation on the stairs would be best. So I decided to paint the treads, risers, and spindles white, and choose a berber carpet for the runner. The handrail will stay its original stained wood finish. As far as the tile goes, I narrowed it down to either this tumbling block tile using the Costa Allegra diamond tiles from Bedrosians, or doing a tone-on-tone checkered tile using 6″ square tiles from Bedrosians. While it is indeed having a moment right now, the tumbling block pattern is a classic look and something I’ve loved for over a decade. I don’t think I need to worry about its longevity. But if I wanted something a little less busy, and perhaps more classic and easy to work with, a checker pattern on a diagonal is a great choice too. Decisions, decisions! 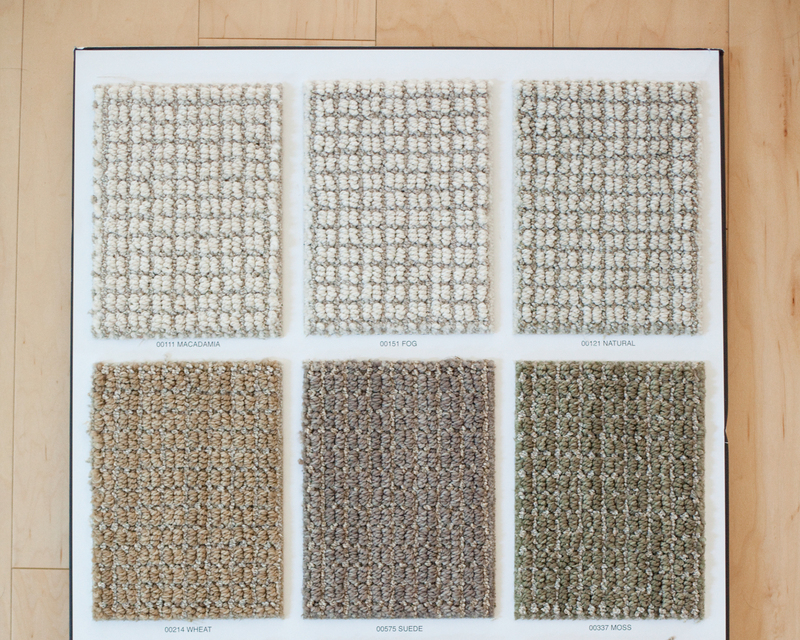 I love the look of natural jute rugs, but let’s be real— jute doesn’t feel so good underfoot. In addition to finding something comfortable for bare feet, I also need a carpet that will be very durable. That excludes using a vintage runner, which had previously appealed to me. I have children and dogs, and I worry about staining and snagging. Because of their great reputation in the field, I began looking into Stainmaster carpet options. I was really happy to see some styles and textures that mimic the look of natural jute, but with the durability expected from Stainmaster. After looking at carpet options at the National Design Mart showroom in Medina, Ohio, I narrowed down my choices to three Stainmaster Active Family options from the Anderson Tuftex line: “Only Natural;” “Abbey’s Road;” and “St. 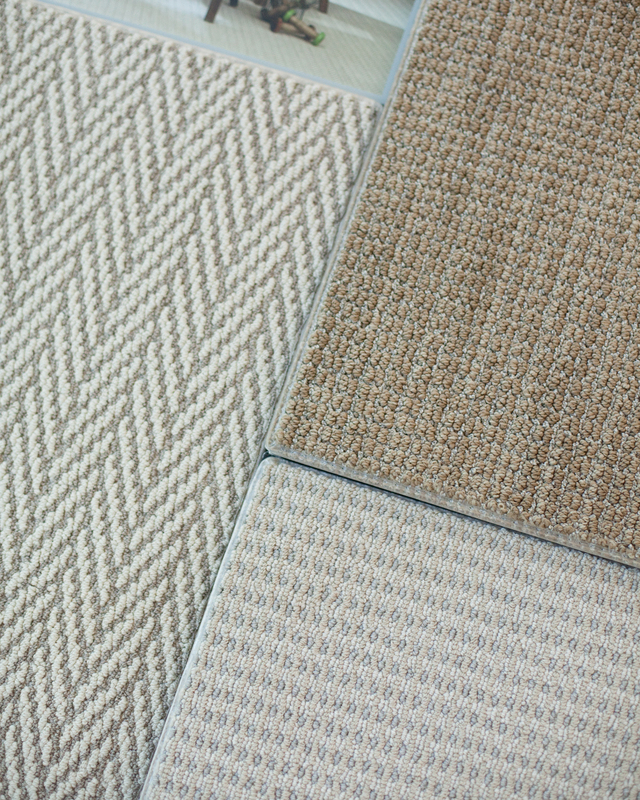 Lucia.” After a week with the samples, I decided to go with the St. Lucia carpet (seen below) because the texture reminds me most of a natural jute rug. Originally I thought I’d choose the Wheat color (on the bottom left of the sample board below), but after considering how it would look on a stark white stairway, I decided to go for Macadamia (on the top left of the sample board). 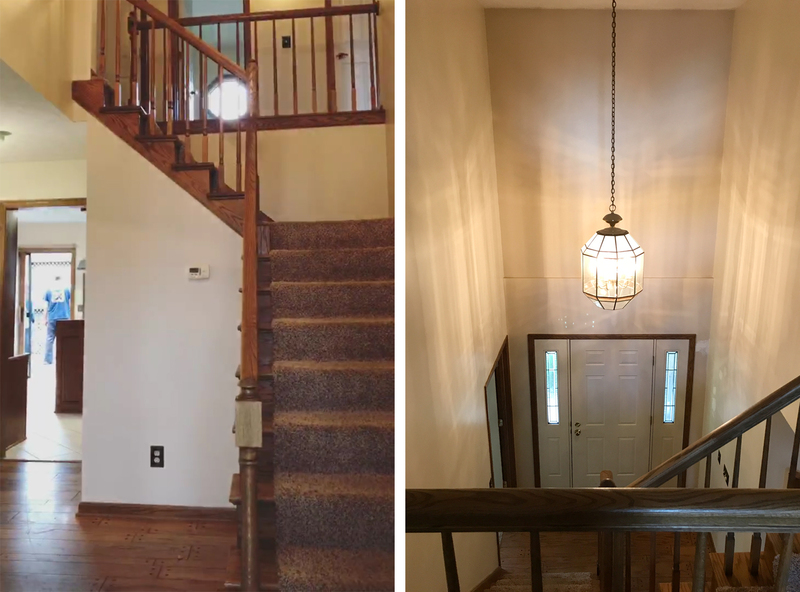 I have a steam cleaner for carpets, and since the Stainmaster carpet is stain resistant, I feel pretty good about choosing a light color, even on our stairs. I’m also considering taking this carpet into our hallway and bedrooms upstairs, and I like the idea of a lighter carpet in there, rather than the darker options. 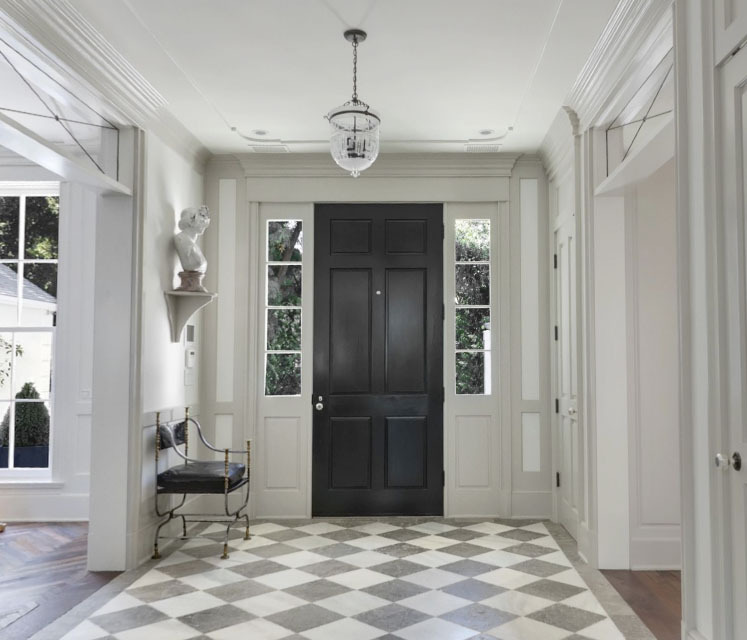 After looking over my inspiration images, I realized that I love a bold, contrasting door with sidelites that match the surrounding wall color. The question is, what color or finish do I choose for the door? And how much glass do I want in here? 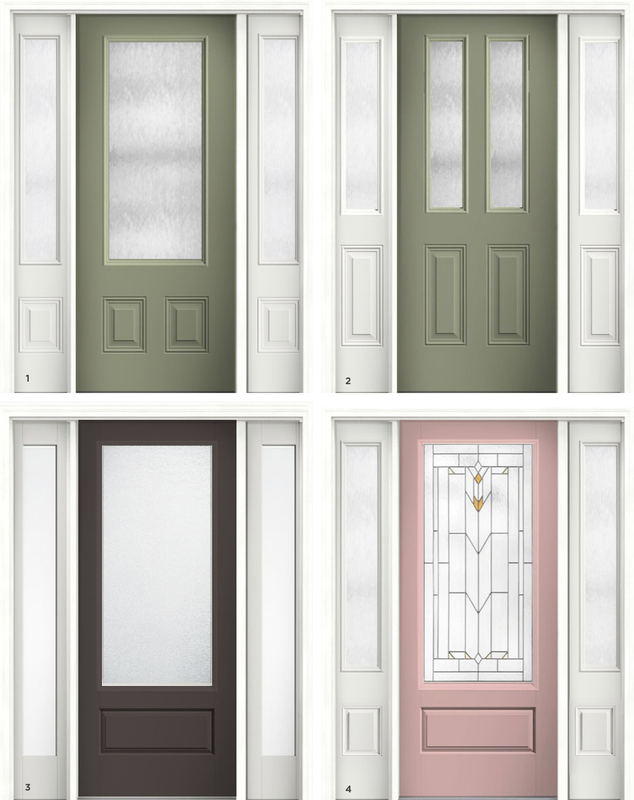 I decided to go with Therma-Tru for our front door set because I loved all of the options for the door and sidelite combinations, as well as the ease of designing a set online using their Design Your Door tool. I went to check out the doors in person at the showroom at Hartville Hardware (my favorite local hardware store! ), and was able to see the beautiful the wood-look finish of Therma-Tru fiberglass doors. I love the look of a natural wood door, but a wood exterior door is simply not practical for the climate in Ohio. Wood expands across the grain during more humid times of year, and contracts in the winter, not only causing doors to stick, but also causing warping over time. Fiberglass is the best option for the look of wood, with superior insulation and durability. Therma-Tru has a several collections, but I personally settled on two favorites. The Classic-Craft Collection offers a wide variety of panel styles, configurations, glass options and five different wood grains to choose from. If I decided to go for a painted finish rather than the grained wood-look, Therma-Tru has some appealing pre-finish color options, or I could always choose to paint the doors myself with the color of my choice. 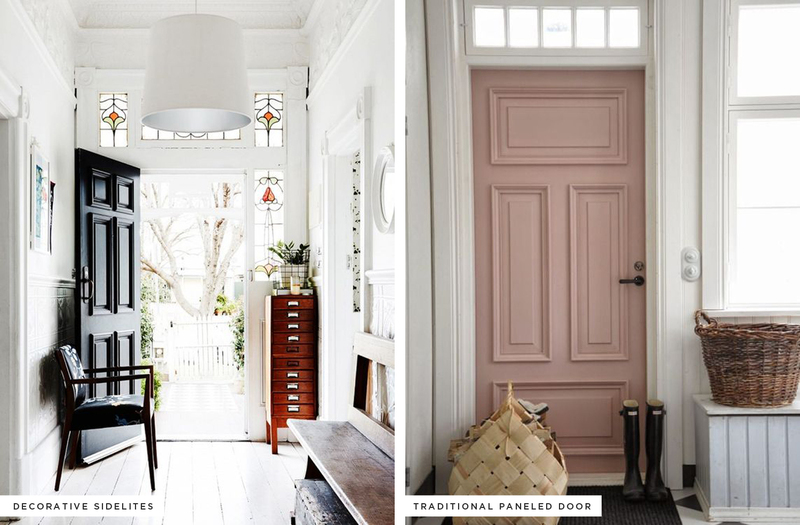 The idea of doing a muted pink door really appeals to me! The other collection I love is the Fiber-Classic Mahogany Collection. These doors look like real wood doors, but with all of the weather-resistant benefits of fiberglass construction. The Fiber-Classic Mahogany Collection also has several stain options aside from the traditional reddish mahogany look. 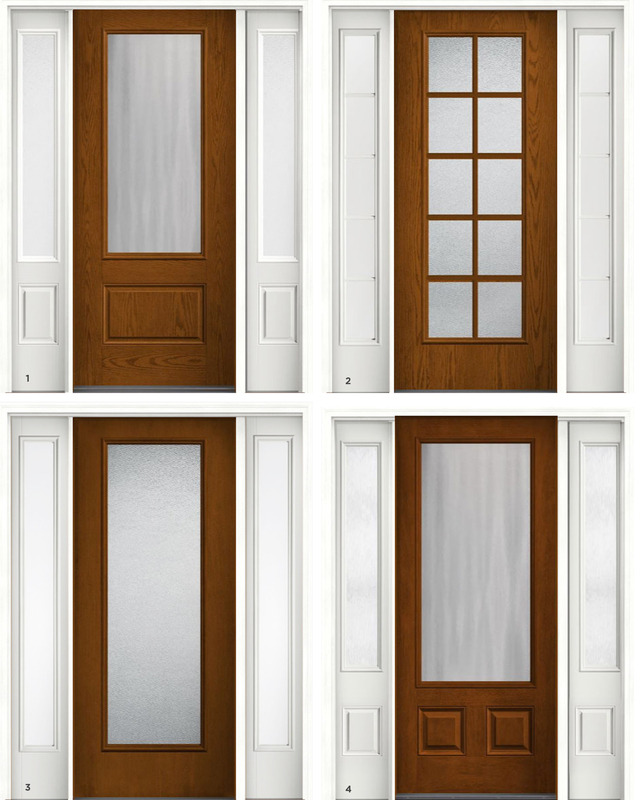 As with all of the Therma-Tru collections, the Fiber-Classic Mahogany Collection offers lots of paneling styles, configurations and glass options, including decorative and privacy glass. In the end I decided to definitely go with a wood-look door from the Fiber-Classic Mahogany Collection. I figure, if one day I wish for a solid-color door, I can always strip the finish and paint it! Which configuration do you like best from the set above? I’m leaning towards #4. I’d love to hear all of your opinions of my finish options! 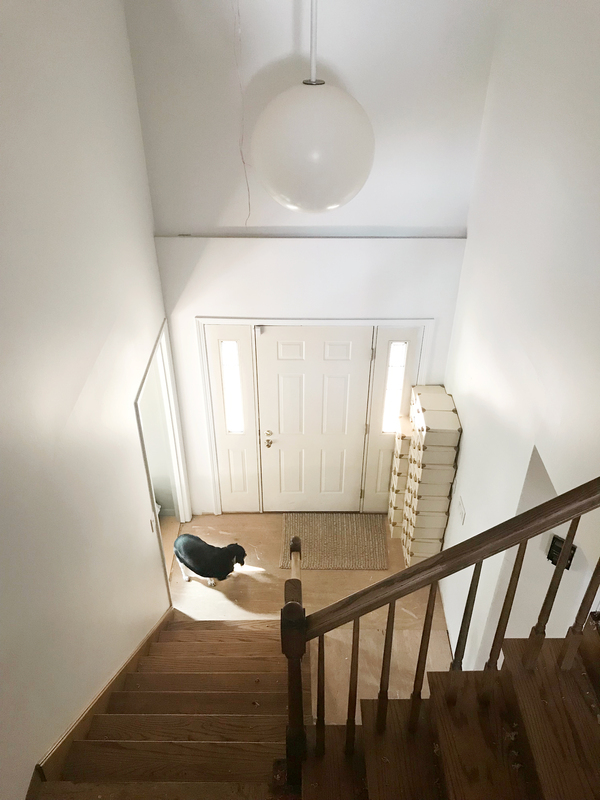 If you want to check out my first round of entryway planning, read this post here! I have changed a few things since then, but the paint, door knob, and other accessories have stayed the same. So excited to begin work on this space! Lucy is now a six year old, you guys! I can’t believe it. 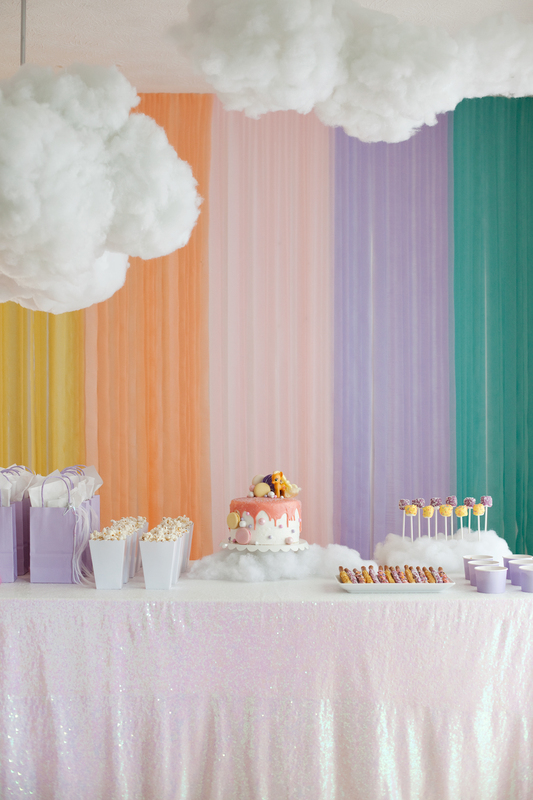 She had her first friends-only birthday party last weekend, which made me feel completely justified to go all out with decorations to make the day super special for Lucy and her little friends! 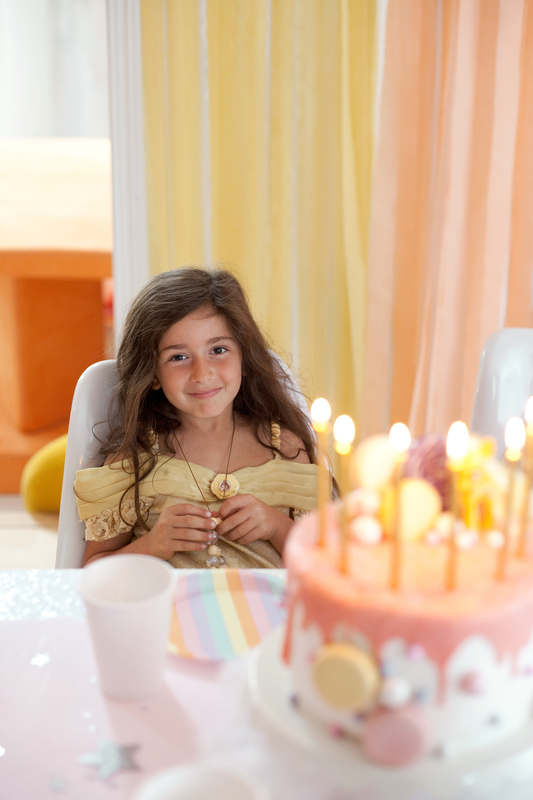 And, who am I kidding— I’ve been dying to plan fun parties for my kiddos, every since I was a little girl myself! 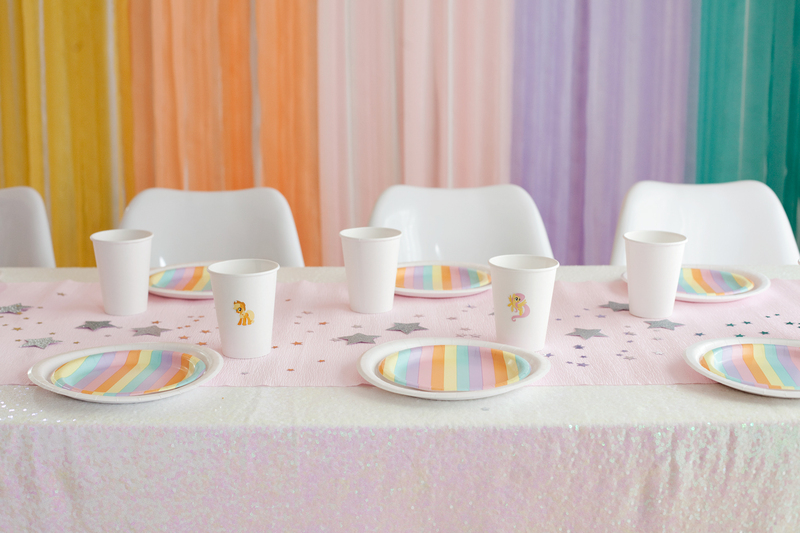 I haven’t blogged the girls’ parties in a while because I’ve been pretty busy with home renovations and honestly haven’t done much besides themed sticker cups and grocery store cakes. Nothing wrong with that, but honestly I enjoy doing more! I put more effort into Juniper’s puppy party this summer, which you can see here at A Beautiful Mess. 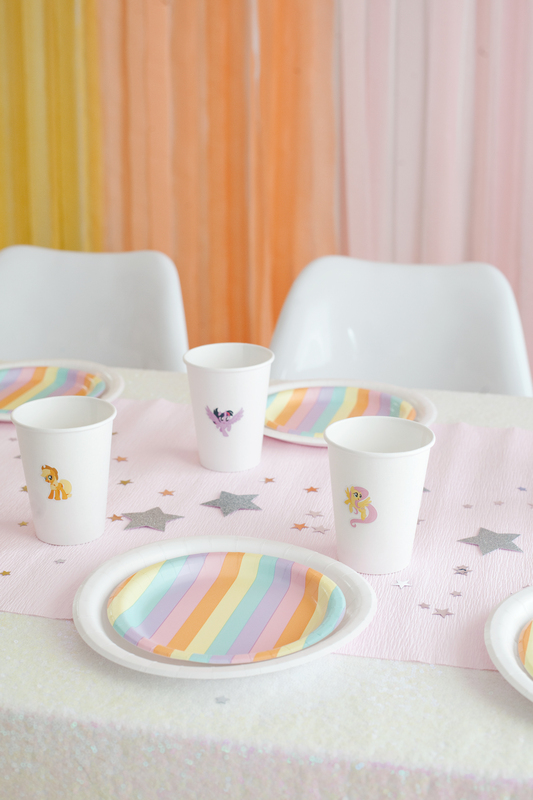 I made my own version of My Little Pony paper cups by purchasing plain white paper cups and decorating them with simple My Little Pony character stickers. I had purchased a pack of stickers to use as party favors, so I didn’t end up needing to purchase anything extra here. It was also helpful for each girl to keep her cup separate without needing to write her name. I found these rainbow cake plates at Target, and snatched them up immediately! 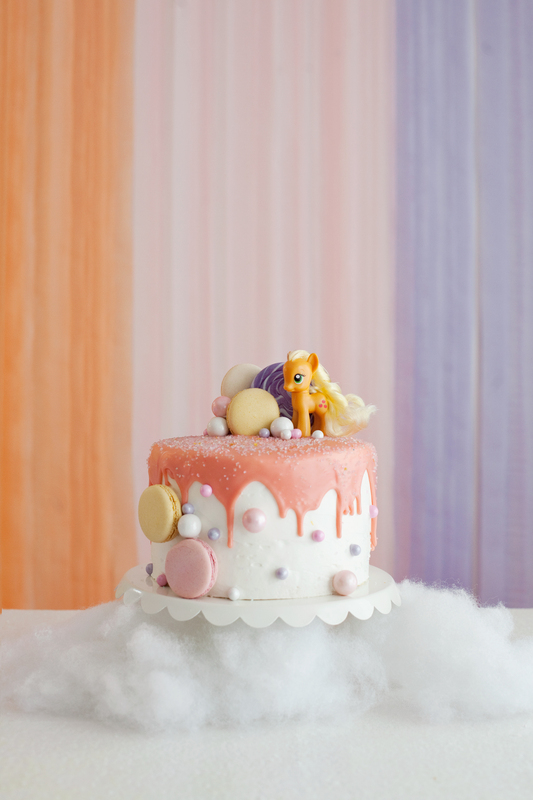 They felt like they fit the mood of My Little Pony, without having characters on it, which would overdo the place setting in my opinion. I used a sequined tablecloth to create a magical base for the table and topped it with a crepe paper runner. Then I laid out some silver glitter stars I had made with a star punch and filled in around them with silver star confetti. For table decorations, the combo was simple, but effective! I purchased a very long sequined tablecloth from Amazon (which I plan to use for lots of future parties!) to add a magical feeling to the table. Across the table I arranged gift bags, popcorn, Lucy’s birthday cake, candy pretzels and pops that we made, and cups of Chex Mix. I also filled a three-tier plate with PB&J sandwiches and made a rainbow platter of fruits and vegetables. 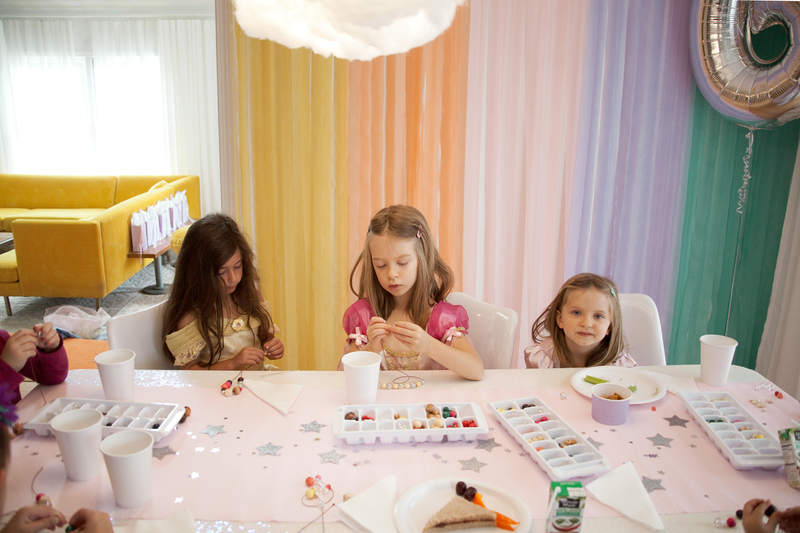 I ended up moving the food table to our kitchen island and used the sequin table for the girls. I had planned for them to eat on the patio, but it ended up being a bit too chilly for that. 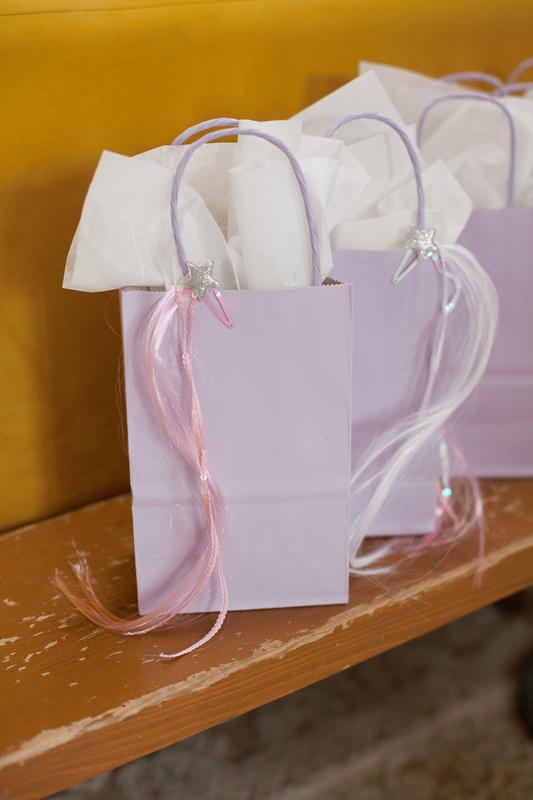 The purple gift bags and snack cups were purchased at Target, and the paper popcorn containers were from a party store. 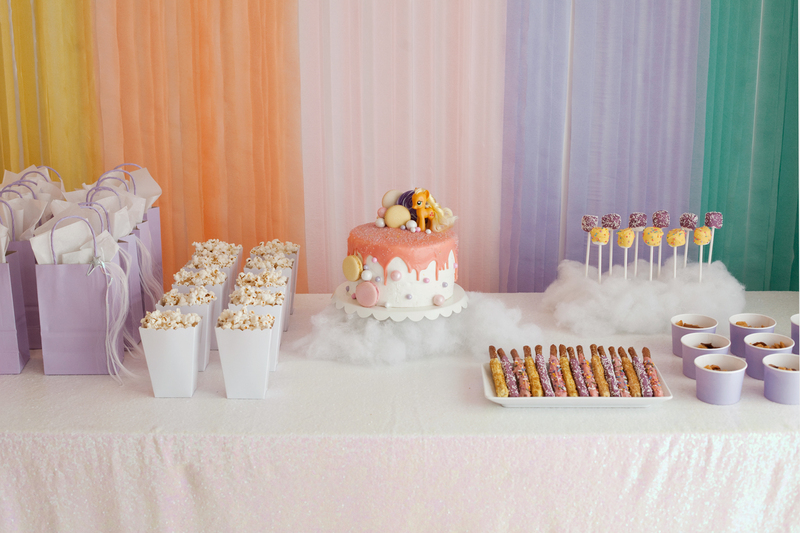 I used a piece of floral arranging foam to display the pops, and added batting around them to look like clouds. I also added batting around the cake stand. To make the floating clouds, I put together this set of paper globe lanterns in various sizes. Then I used a hot glue gun to attach lumps of batting. I didn’t focus too much on the shape of the batting, just making an effort to attach it to the paper lanterns. Then I used fishing line to hang the clouds from the ceiling, attaching them into the plaster with white thumbtacks. I also took off the glass globes over my ceilings lights and slipped the paper globes in their place. Once all of the clouds were hung, I used a chopstick to tease out the batting and connect the various sizes of clouds together. To make the clouds realistic, I grouped different sizes near each other and teased them together. Hanging them individually wouldn’t have looked as good, in my opinion. So, I’m a pretty decent baker, but with everything else I had going on, I figured I should leave the birthday cake up to a professional bakery. However, I wanted to decorate it myself! So I ordered a plain white cake, picked it up early in the morning on the day of the party, and decorated it when I got home. To decorate it, I did a white chocolate ganache drip-glaze. This was my first time attempting a drip glaze, and I thought it went pretty well! I used 4 parts melting chocolate (they were already this color) with 1 part heavy cream. I melted it slowly in the microwave (you can also use a double boiler), stirring in between 30-second increments. Then I let the ganache cool for a couple of minutes and poured about 1/3 of the ganache into an icing bottle with a medium size tip. The other 2/3 of the ganache I poured on the top of the chilled cake and smoothed it out towards the edges with an offset spatula. Once it neared the edges it began to drip down the sides. At this point. I added extra drips with the icing bottle. It sets up super fast, so this part has to be done quickly, or perhaps you may want to make your ganache a bit thinner than I made mine. The buttercream icing held up well against the ganache because it had been chilled. Pouring the ganache on the chilled cake also aided the hardening of the ganache, so keep that in mind as well. As soon as I poured the ganache, I began decorating the top of the cake, to take advantage of it as an adhesive element. I used macarons (from a bakery) , one lollipop, and sixlets and gumballs I had purchased from a party store. Around the edges I used some royal icing to glue the decorative candies, lest they fall off the side of the softened buttercream. Decorating a grocery store cake was a lot of fun, and I plan to do it again for various themed parties! I didn’t feel the need to buy pony gift bags or craft any special gift bags, but I did keep the contents on theme. I filled the bags with My Little Pony stickers, My Little Pony rings, My Little Pony tattoos (from a party store for $.99), one 4″ My Little Pony doll (found at the checkout line at Target for less than $3 each! ), and these clip-in fake hair clips that I also used to decorate the outside of each bag. After Lucy opened her gifts, I had each of the little guests select a party bag and open them together. I think the girls really loved their gifts! Here’s what the food table looked like when I was setting up, before I decided 64 degrees was probably too chilly for the girls to eat out on the patio dining table. Then I moved the food over to our kitchen island and set up this area for the girls to eat and craft. 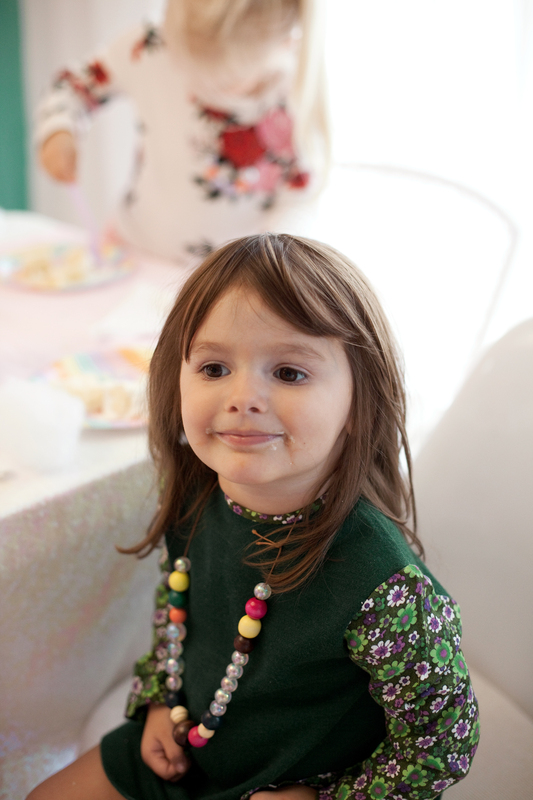 After eating, I brought out ice cube trays full of beads for the girls to make their own necklaces. Then we served cake and sang to Lucy. After cake, we moved the party to the living room where we did presents and then the girls played a favorite school game, Four Corners. It was honestly a lot of fun having the house overrun by girls! I suppose I am cut out for this parenting job after all. :) I’m sure the girls had a lot of fun, and I’m glad I survived and managed to have some fun as well! Let me know if you have any questions about any elements of the party, and I’ll be happy to answer it in the comments below. 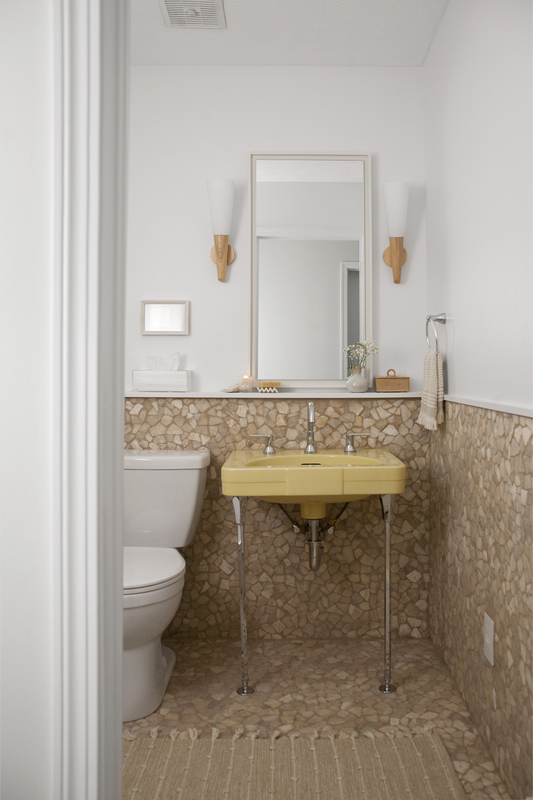 I’m so excited to share the final images of our powder room makeover with you! I had a lot of fun planning this space, a mild amount of fun tiling this space (okay, so not really that much fun— though I did listen to a lot of podcasts! ), and even more fun reveling in the “after!” Check out the “before” of this space below. I know the design of this space is not for everyone, and that’s okay! Because most of you won’t be actually using this space on the daily. :) We’re really happy with how it turned out, and I feel like it’s exactly that I was going for. A little mid century desert design in a tucked away corner of our home. 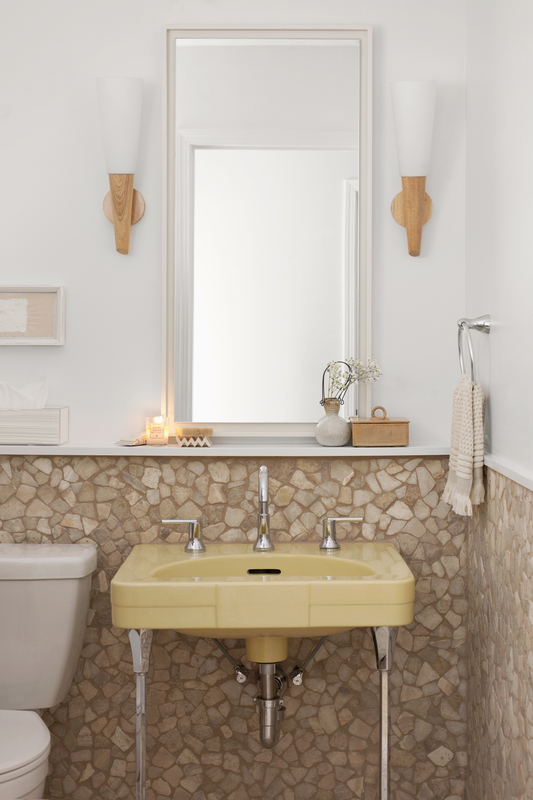 I brought in elements from elsewhere, like the fieldstone fireplace, yellow accents I always love, and mostly neutrals. 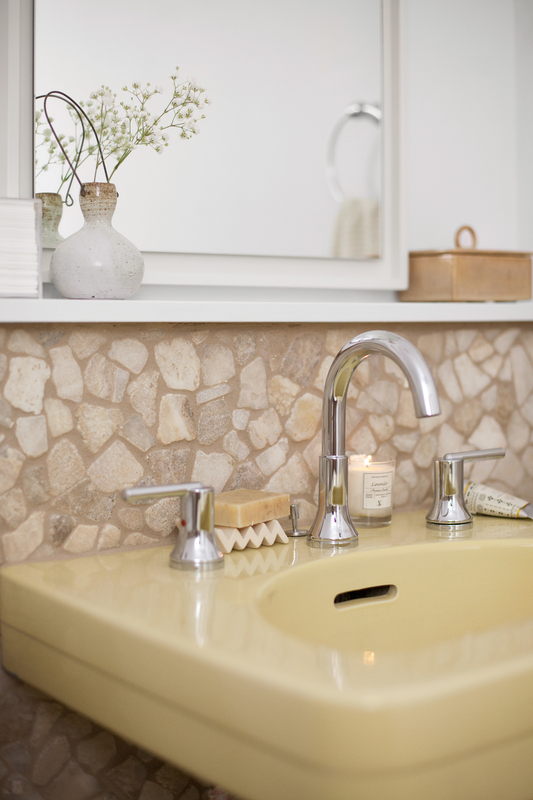 with handmade and textural finishes. This project was sponsored by Delta Faucets for A Beautiful Mess, so we were provided with some of the material needed, including this sleek chrome faucet that I selected for its simplicity and air of graceful and modern design. 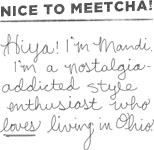 Plus— I’m all about that chrome! 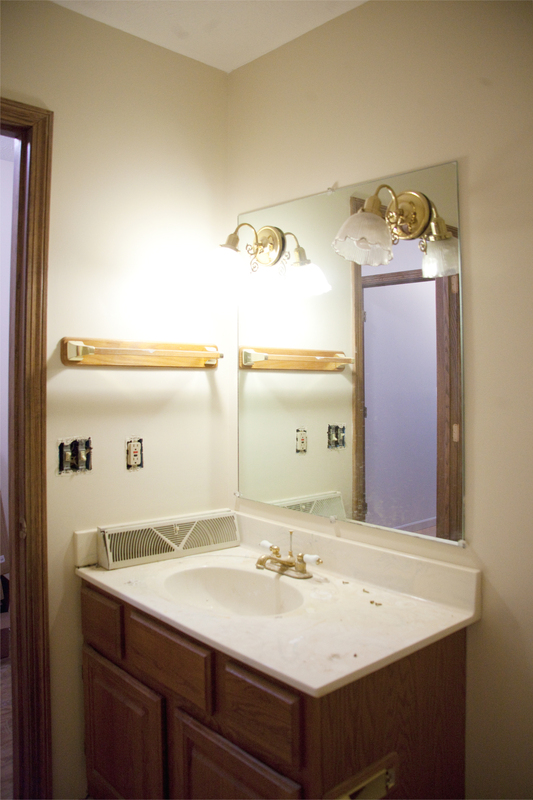 We also worked with J&J Plumbing to move our existing plumbing to new spots, and to hook everything up. If you’re in need of reliable and knowledgable plumbers in the Northeast Ohio region, be sure to give them a call! 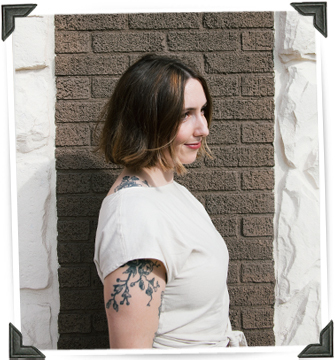 If you would like to check out the planning posts for my powder room makeover, check them out here and here. The full reveal, details of building, and info on working with a plumber is here at A Beautiful Mess. There are links to everything I used here at the bottom of this post too! As most rooms in my home, I’m sure this one is bound to evolve over time, but for now it feels almost perfect. There are some things I’d like to add, like a rug that’s better for here (this one will be moving out to our garage entry), a wall-mount magazine caddy, and moving the sink and light situation to the right about three inches. I’ll be sure to share with you if I make any major changed in here! Thanks as always for following along with me! It’s a lot of fun for me to invite you all into my home and share projects with you. In case you’re curious— next up is the entryway! I’m super excited for the changes that will be happening in there. Spoiler alert: I’m have my tiling work cut out for me!